You will never have to struggle with manually rolling your shade. Our Microcassettes include a standard 110 volt integrated tubular motor completely concealed inside the cassette. There are a wide variety of control options from a simple switch to full integration into building automation systems. Automation connections may be made to both state of the art new systems as well as existing installations. 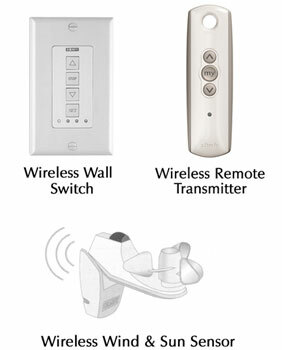 You can add wireless remote controls and a variety of sun and wind sensors. 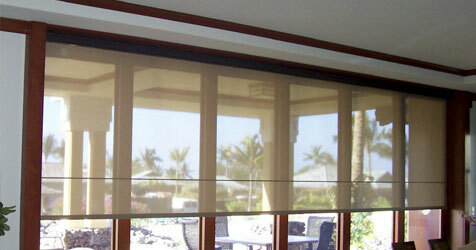 Your Worldscreen shade can provide sun protection or room darkening all automatically! You will save money too! Automatic solar control and the ability to span up to 40’ wide on one motor will significantly lower cooling costs as well as reduce your initial investment. The motors and controls carry a limited 5 year manufacturer's warranty. Please contact us for illustrations of the controls and some basic wiring diagrams.